The birds and bees haven't been the only things busy at Reserva Las Gralarias this spring! Springtime quickly becomes summertime at Reserva Las Gralarias as our days lengthen (about 30 minutes longer), and the sun all of a sudden appears in the far north. Yes, even on the equator the seasons are noticeably different (although not nearly as dramatic as in the higher latitudes), and in spring everyone and everything seems to burst into busy-ness, including Reserva Las Gralarias! March - May 2016: Thanks to Ray So, we now have about 90 species of orchids documented at RLG, photographed and identified at least to genus. 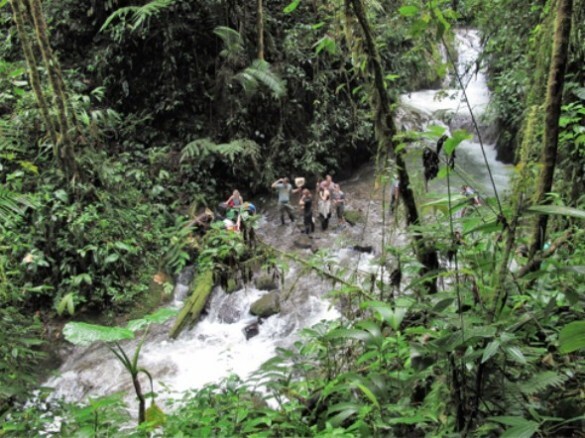 He and colleague Kwan Wong even found 15 species of orchid on one single log! Thanks go to Tim and Kathy Krynak for hauling two volumes of Native Ecuadorian Orchids to the reserve which has helped immensely in identification. Ray has found some stunningly beautiful species--we thought we'd share a few! 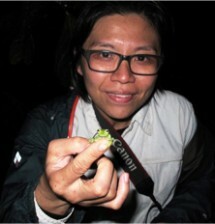 April 2016: In April we welcomed Hong Kong biologist and tadpole expert Kwan Wong who helped us to set up a system for caring for any tadpoles that may need in-house care. Thanks to Dr. Katherine Krynak for donating to RLG a water pump and fish food for the tadpole system! April also afforded us many records of perhaps our most famous frog, Pristimantis mutabilis, the "Punkrocker" frog, discovered at RLG by Tim and Kathy Krynak. This frog is the only vertebrate known to change its shape from smooth to spiky and back again within seconds. (L to R) With the help of springtime rains, glassfrog eggs hatched into tiny tadpoles; spring also brought many reports of RLG's famous Pristimantis mutabilis. 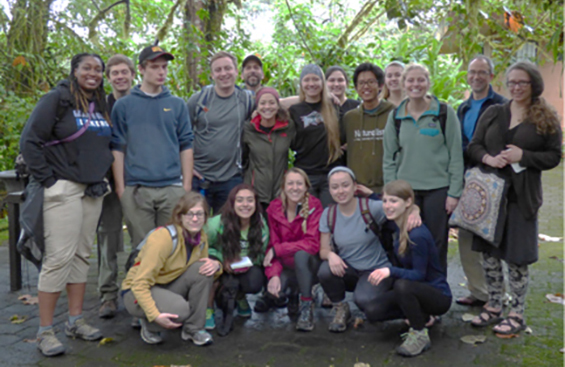 May 2016: We finished up springtime with a week-long Tropical Biology course from Grand Valley State University (Michigan, USA) led by Dr. Eric Snyder, Dr Katherine Krynak and Las Gralarias Foundation President Tim Krynak. It was very exciting to see so many young students become enthusiastic tropical field biologists, studying aquatic insects in our streams, hummingbirds in our forests, finding surprising numbers of anoles asleep among the vegetation, watching bats in the gardens, frogs in the creeks, epiphytes on the trees and so much more. Below are just a few photos capturing the students' experience at RLG. 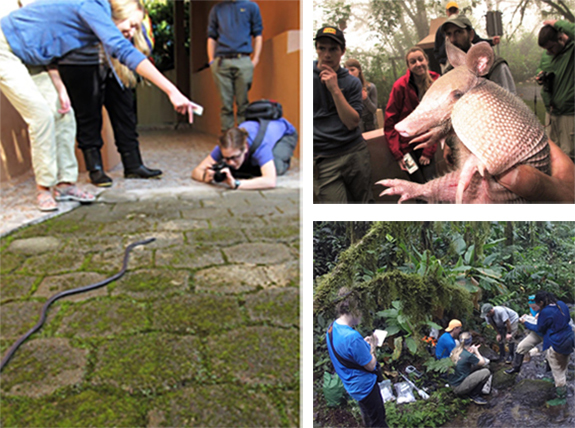 (Clockwise, from L) Students photographing a meter-long Caecilian; students meeting a baby Nine-banded Armadillo; the student Stream Team gathering various measurements from Lucy’s Creek. One student team recorded some amazing data as they studied sleeping anoles. 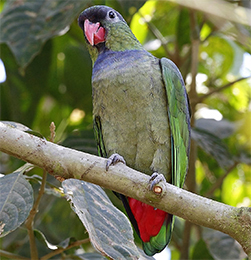 Finally, by the second week of May, we were hearing large flocks of parrots flying around the reserve and inspecting fruiting trees near the guest houses, with this Red-billed Parrot among them. The large post-breeding parrot flocks are a sure sign that summer--and many exciting sightings--are both just around the corner! and catch up on more news!